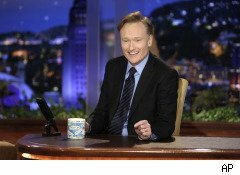 Our long national nightmare is over: Conan O'Brien and NBC are parting ways in peace, if not amity. In a deal first reported in The Wall Street Journal and expected to be announced officially later today, the network will pay the Tonight Show host $32 million to walk away from his show, stay off television for an unknown duration and avoid saying anything disparaging in public about NBC or its executives.The bones of the agreement have been in place all week, but O'Brien reportedly held out in an effort to negotiate more severance money for his staff and crew. It looks like that tactic succeeded: The final package includes $12 million for Tonight Show employees, up from $8 million earlier, and O'Brien's manager says the star will further supplement that amount from his own funds. Team CoCo, anyone? Resolution of the standoff means there are no longer any obstacles to reinstalling Jay Leno behind the Tonight Show desk after the Winter Olympics, as NBC plans to do. Whether Leno will be able to generate the same kind of ratings he did before his disastrous move to 10 p.m. -- and, more to the point, before the beating his nice-guy reputation has taken over the past three weeks -- is uncertain. One party that will be watching particularly closely is Fox, which is said to be mulling creating a late-night show of its own at 11:30.